Linda published this awesome e-book just last week and sent it to me. Thank you, dear friend, for this great Kinesiology toolbox! Kinesiology has written already some history in my life. The first time I have heard about Kinesiology was during my training to a life coach. The trainer, Bernd Isert, who died a few years ago, showed us the Arm Test. At the time when I started my training to coach, I just finished the preliminary version of my doctoral theses and successfully applied for a new project for that, I wrote the proposal together with my former colleague and friend. Later on, I became familiar with the work of Donna Eden. After studying her books: “Energy Medicine” and “Energy Medicine for Women”, I have purchased “The Energy Medicine Kit.” The kit contains a booklet describing the exercises, cards with exercises and videos. In these videos, Donna Eden shows how the Arm Test works, and how you can use it on a daily basis. 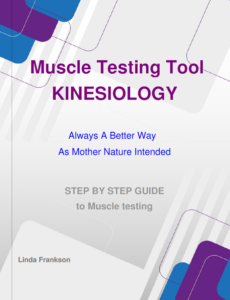 First off, I found it very interesting that the Arm Test wasn’t the only method in the Kinesiology. I got interested and tried the testing tool for the very first time myself. For my first experiment, I have chosen the Sway Testing Method. I thought it would be the easiest to start with. Linda herself told me later that this method was also her first choice. Using the Sway Testing Method your body is swaying back and forth: forth for a Yes and back for the No. It was a while since I was on Linda’s website. Different life events have pushed the Sway Testing Method into the background of my memory. One day I suddenly recalled the technique and decided to apply it instantly. Because I applied the technique from my memory, you will notice some differences between what I did and the technique, Linda presents in her e-book. I used even more questions to get sure I get true answers, for a while, until I got each possible answer minimum three times. I thanked my body for cooperation. I was prepared for the test. 6) Magnesium Spray with organic ingredients from natural plant extract resolved in purified water with the addition of organic Lavender in a glass bottle. After I warmed up testing the Yes and No answers with short questions, I started to test each item after another. The only position I didn’t test was the neutral position. I tested each item taking it in my hand and holding it for a while. After I have tested one item, I was stepping forward to the next one. As Linda describes in her e-book the questions should be very simple and clear. The more clear the questions, the more precise the answer. For some items, I also asked more detailed questions as e.g. for how often would be OK to consume something without disadvantages for the body. Nr. & Item Is the item good for you? Is the content of the item good for you? Is it helping? How often can I use this item without disadvantages for my body? Double “yes” means my body moved forward two times before it found back to the neutral position; by the yes/no my body swayed forth and back, then found back to neutral position. Very important for the testing is the intake of water. Our body contains about 65 percent of water. To work properly the body needs water, especially before and after healing processes, meditation (especially when you use the brain wave technology), testing with the body or learning. And, in all other cases. Smile! The results show clearly that plastic is not good for us, even plastic from plants. Mostly the plastic bottles made from plants contain only about 30 percent plant quantity. Some plastic always passes to the water. I use to drink four bottles a day. I already considered eliminating the plastic bottles and use instead of more rainwater to drink from our rainwater catchment – I live in Hawaii, and we live off the grid – but this idea became more urgent! At the moment, we drink our water only boiled, even though we use the Big Berkey for purification that is known for taking out of all contaminants in the water. Also, the responses of testing Witch Hazel were first off confusing to me. Because this product has only two ingredients, I tested both of them and found out that the alcohol is it, that dries out my skin why I got first a “No.“ The ingredient Witch Hazel got a “Yes.” Since my testing results, I have used the Coconut Oil, and recently the Body Butter I have got from my Mom-in-law more frequently for my hands. I use the Sway Testing Tool for about four weeks now and I already noticed that my bodily sensitivity to respond is increasing! I noticed this during the very first testing how easy the answers come after practicing it for several minutes. My body was literally shooting out the answers, calling for even more questions! I also want to implement the 1 to 10 scale technique for questions how much or how often to use something. The important event for testing occurred last Sunday. Our little family extended with arriving of two rescue kittens; one about two weeks ago and one, a only eight-weeks-old kitten about a week ago. Last Sunday was our Maku’u Market day where my husband is a vendor selling off bikes from our bike rental business. However, I rejected to join him that time.I found it irresponsible to leave those newcomers alone for about eight hours. My husband became upset and left without saying goodbye. First off, I felt bad. But in this very moment I felt a discomfort in my stomach I remembered the testing tool and applied it instantly! My body gave me a “Yes” instantly. I felt a release immediately. I thanked God for having this method and Linda for introducing the method to me. The Sway Test Technique utilize the natural reflex of the body to answer questions. Isn’t it amazing getting responses from your own body?! It is so beautiful and so empowering! Your body will always help you to find great solutions for anything you are looking for. I know about the intelligence of the body. I’m aware of the intelligence of every single cell and this for a long time already. However, it took me many, many years to finally start to use this simple, effective and overall helpful method. Please, decide and start to use that method! Do it better than me! It is only a matter of decision! Thank you for taking time and reading about my experience. Please, leave a comment and let me know how the method is working for you! This entry was posted in Mental Methods, Mindfulness, Muscle Testing, Review, Sway Testing Method. ← Four Magic Phrases Can Change Your Life! Dearest, Jenna, I am honored that you placed my muscle testing guide on your website and shared your results. Each and every one of us has a different approach, you are a very special sole and I appreciate you very much. Anybody that adapts this technic to there lives will find answers to there concerns. Whether it be for your own family members or even there pets. There is no end to questions that we have and we can get those answer just with a simple yes or no. I was in the supermarket the other day and there were several products to choose from but what I wanted to know which one was best for me. I got the answer I was looking for. Each and every one of is unique what might be good for not necessarily will be good for another. For example, in a family of five children, there might be one that is lactose tolerant, and the other four will be fine. Another example is some people will have a very high tolerance for a certain product and others will have a very low tolerance. With the help of this simple technique, we are able to find balance in our lives. Thanks again Jenna for the honor you bestowed on me I am humbled. I thank YOU, Linda, dear friend!! With the muscle testing tools, you opened a completely new playground for me, and I’m looking forward to exploring it and playing! You are right!! There are no limits for this method. You can ask every question and get an INSTANT RESULT! I know applying those tools on the regular basis will lead to an “upgrade” of my body in my whole energy system. My body has gotten her own voice and doesn’t need to talk to me via symptoms! My Mother had cancer in 1973 and after awful radiation treatment, on coming home, she decided to educate herself on food and the effects it has on the body. She would start using her pendulum when wanting to eat something and most of the time the pendulum would say no. She lived till 1997 but I am convinced that is because she changed her diet. No more man-made foods. I will definitely look at Linda’s book, a great help in our modern day life. Yes, I agree, it is awesome!! And it is simple and effective. Since I have tried the Muscle Testing Method I asked questions for different issues and – as you describe – received an instant answer. I just trusted that answer because it is my own body who is responding! My body has more room in my entire Jenna-system. This is a great feeling! In the school, we get trained to believe in books and the opinion of authorities. I’m fortunate to have a strong and sensitive intuition. But I did a lot of thinking through my life, looking up answers. It is for the first time in my life I have such a powerful tool at hand and my body is the authority! I’m very impressed by your Mom. Back in the 1970s, we didn’t have all this information available as we have now. There weren’t so many self-help books either. She did the right thing for herself! I recommend Linda’s book to you, Taetske, and the methods! It really works! You need only to remember it is available to you and and use it! Thank you so much for taking time for reading and commenting! It means a lot to me! Please, let me know how I can support you! I’m there for you!